If you are looking for a colourful climber, creamy white flowers with contrasting purple stamens, then Clematis florida Sieboldii is one of the best. The flowers are large, and is said to resemble those of a passionfruit, although they are not as big as the dinner plate types, they do contrast well against the mid to deep green foliage. As far as clematis are concerned Sieboldii is a medium sized grower, it will reach around 3 metres in height and spreads out to around 1 metre. Use it in the garden to cover a trellis, archway or as a flowering wall cover. 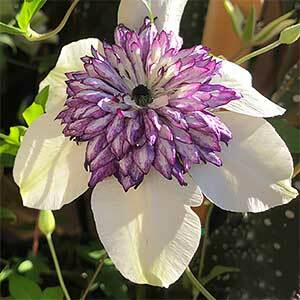 The trick to growing most clematis is to have the root system in the shade and let the plant itself grow into the light. In deep shade the plant tends not to flower well, so at least good morning sun or very good filtered light work well. Prepare the soil well by digging in some extra drainage material if needed. Make sure that the root system, is in shade wherever possible. Allow the soil to dry partly between watering. Flowers are produced both on the last seasons growth and on the new seasons growth. The first flush of flowers will be on the last seasons growth, the second flush on the new growth. This means that the best time to prune is after the first flowers. If the plant is old and in need of rejuvenation, then prune it in early spring. Remove the very old canes and then prune back to good buds on the remaining stems. Common Names – Narrow Leaf Agave, Narrow Leaf Century Plant. Plant Spread – To around 1m. Position – Full sun, roots system in shade. Flowers – White petal with purple stamens.